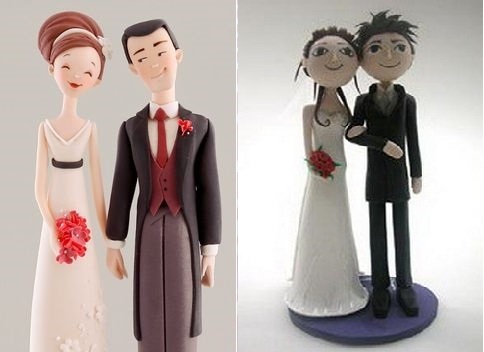 Sugar-crafted bride and groom wedding cake toppers continue to be hugely popular with young couples getting married and go really well with novelty style wedding cakes or funky designs. 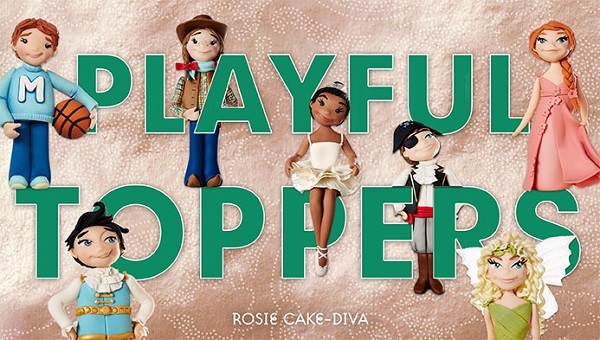 Aside from the classic sugar-crafted style cake toppers, “peg-style” cake toppers are also very much on-trend at the moment for the more alternative or boho bride. 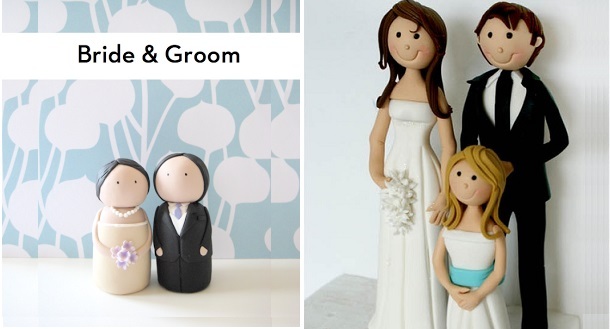 We have a great example above right from the brilliant Eat Cake Be Merry who have published a tutorial to make this peg style cake topper here: Bride & Groom Cake Topper Tutorial. Sugar modelling expert, Verusca Walker has put together one of her hugely popular picture tutorials (below) of all the elements needed to create her stunning bride & groom,pictured above right. Next, we have a wonderful example of vintage style bride & groom topper sculpted by one of the world’s leading sugar artists, Carlos Lischetti. You’ll find the full instructions to recreate this cake topper in his first book, Animation in Sugar: Take 1 . 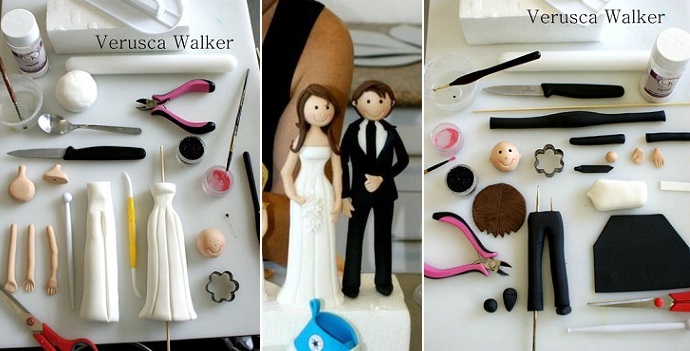 For a more “alternative” couple, you’ll find the instructions for the funky bride and groom cake topper (below right) here: Bride & Groom Cake Topper Tutorial. 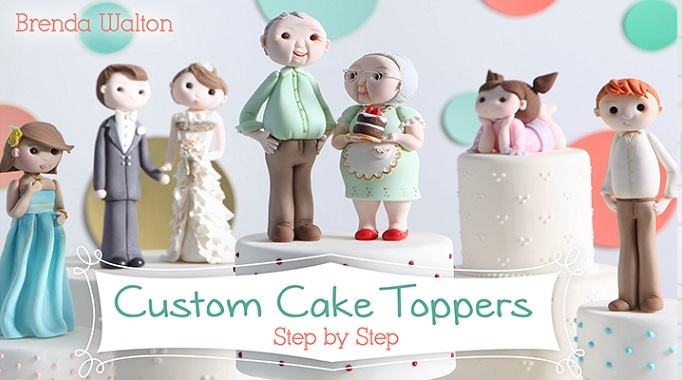 You’ll also find some instruction from Wilton on creating wedding cake toppers: Standing Bride Model, Standing Groom Model, Sitting Bride and Sitting Groom. For bridal hairstyles (and grooms’ hair too) Lovely Tutorials have a selection here: bride and groom topper hairstyles tutorials. 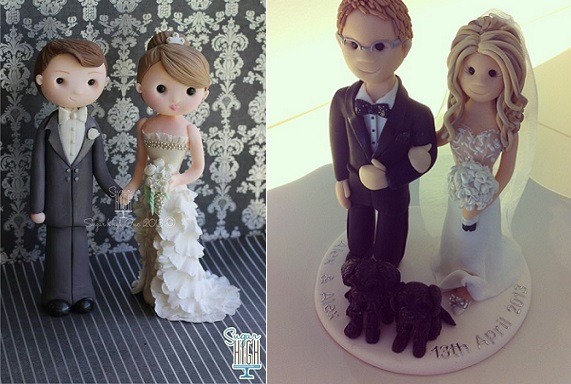 As you practice creating bride and groom toppers more and more, you’ll eventually start to develop your own style. In the meantime, we have some fabulous sugar models to inspire you. Sugar Couture Cupcakes and Cakes crafted the beautiful family wedding cake topper (below left) including the wedding cake designed to complement the brides ruffle wedding gown. A second wonderful example below right, in a cartoon style also (image via Tumblr). Author Lindy Smith created the fabulous bride and groom wedding cake toppers below and you’ll find more details on Lindy’s cake topper classes here. 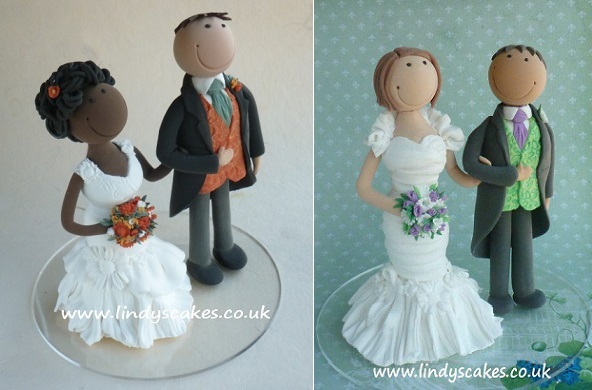 Lindy also sells perspex discs in her online shop to which you can afix your cake topper so it can be kept as a souvenir by the wedding couple long after their wedding. 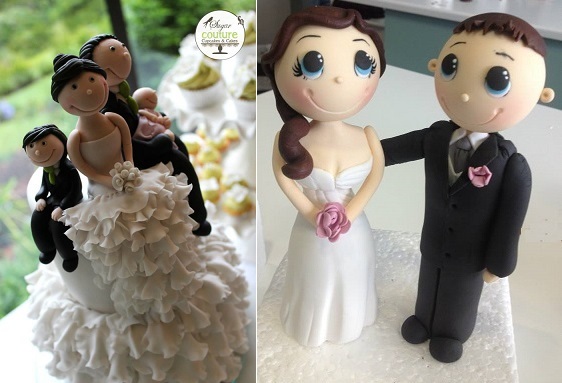 If you’re Sydney based, Handi Mulyana of the renowned Handi’s Cakes teaches cake topper classes, including his bride and groom models below left. 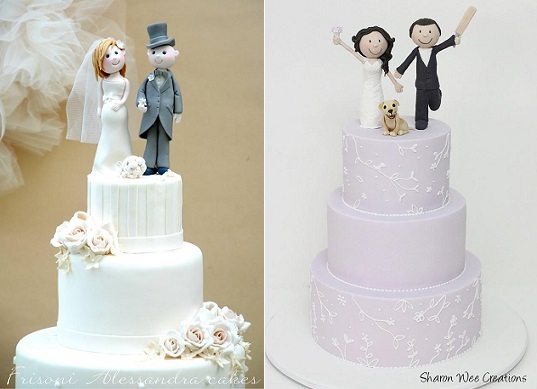 Author Karen Davies created the beautiful bride and groom models (below right) and has instructions for a similar standing bride and groom in her book, A Cake for a Wedding . If you struggle to create nice faces for your models, Karen has very useful face mould available to buy through her website and at all good sugarcraft stores. 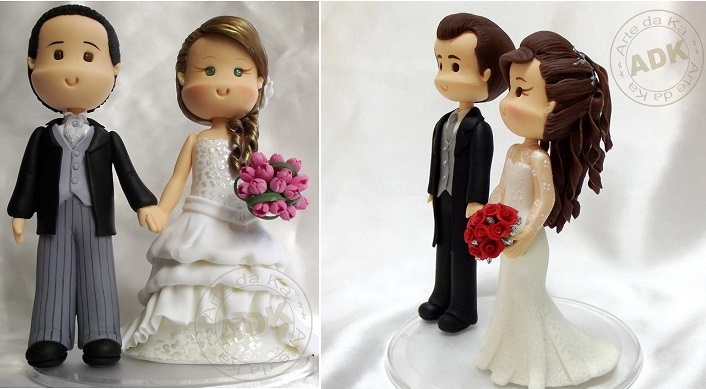 Brazil’s wonderful Arte da Ka designed the two beautiful sets of wedding cake toppers below in their signature style. 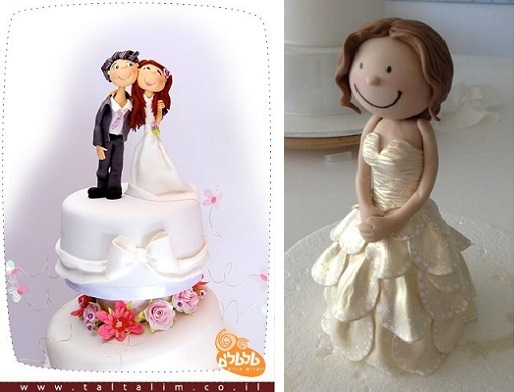 World renowned sugar artist, Israel’s Tal Tsafrir creates wonderful cartoon-style cake toppers including the lovely bride and groom cake topper, below right. To the left, we have a fabulous bride topper by Sharon Wee Creations in a customised couture gown. 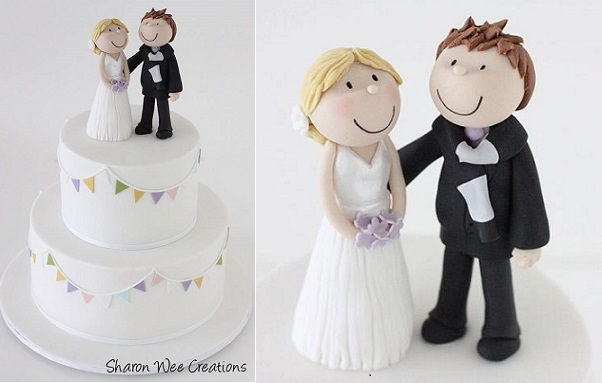 Sharon has a tutorial for the super cute bride and groom cake topper below available to buy through her website: Sharon Wee cake topper tutorial. A beautiful bride with her bump and a groom in morning suit by Alessandra Frisoni (below left) and a super happy newly-married couple below right by Sharon Wee Creations. 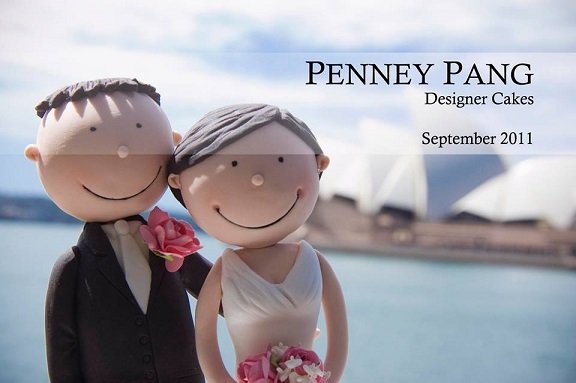 Penney Pang Designer Cakes created the cute cartoon wedding cake topper below which shows what a terrific addition a topper can make to the wedding album! 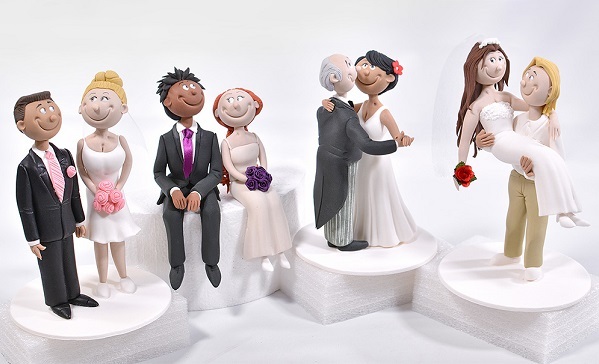 Don’t forget to think about the placement of your bride and groom models too – a cake topper doesn’t always have to be on top of the cake. 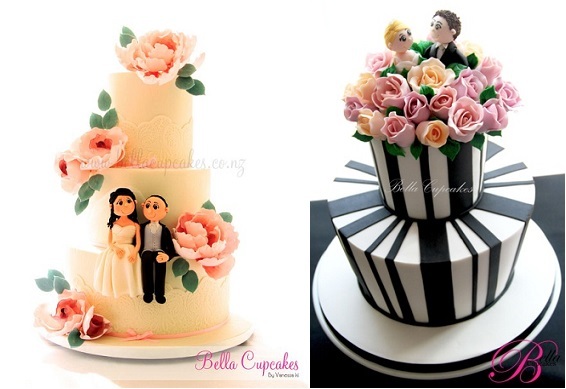 Below, we have two examples from the wonderful Bella Cupcakes, NZ. 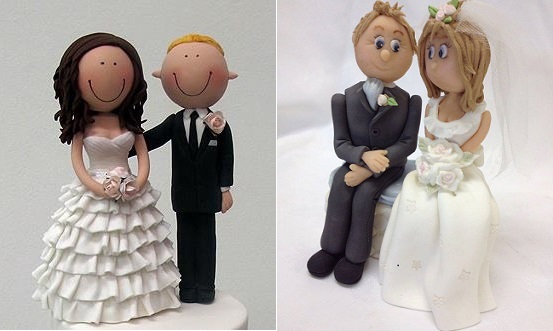 And while they’re not quite edible, the handpainted “peg-style” cake toppers below are enormously popular at the moment. 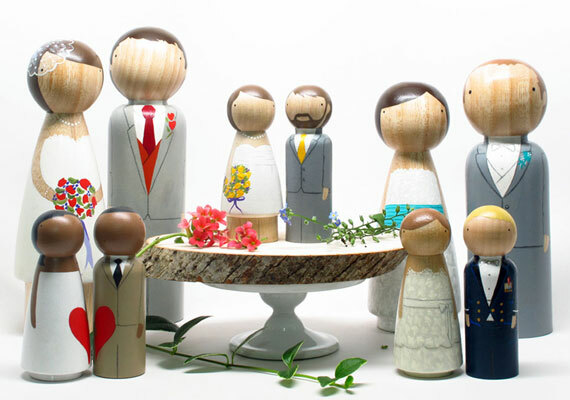 The wooden pegs are available to buy online, including from Goose Grease on Etsy, who also have a tutorial showing you how to paint your bride and groom here: diy bride and groom cake topper tutorial (wooden peg dolls). 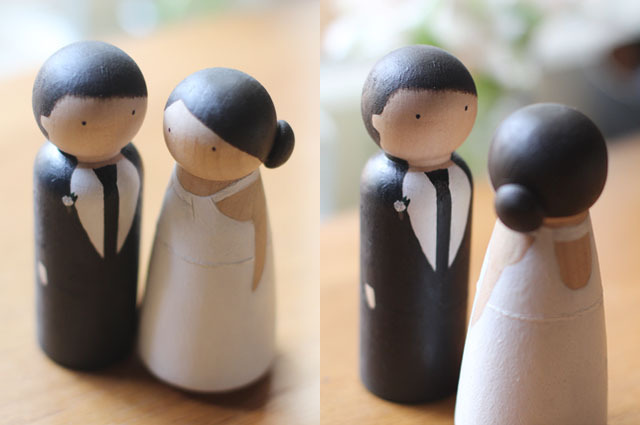 More peg doll inspiration below, including a tutorial from the Elephantine blog: diy cake topper tutorial (wooden pegs). Just remember to set your cake topper on a circle of clear acetate when placing on top of the wedding cake – craft paints aren’t food safe! For Cake Geek updates, just add Cake Geek Magazine to your Facebook “likes” and we’ll let you know just as soon as a new feature is published. You’ll find us here at: Cake Geek Magazine Facebook Page.